Once upon a time in a castle high on a hill lived an inventor whose greatest creation was named Edward. After the inventor's sudden death, Edward lived alone in the darkness until a kind Avon lady took him home to live with her family. Trailer. 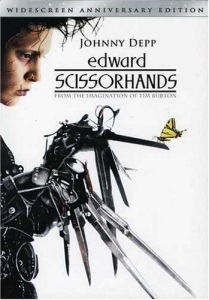 Edward Scissorhands is a 1990 American romantic dark fantasy film directed by Tim Burton. Buzzfeed: 31 Facts You Probably Don't Know About "Edward Scissorhands"
When Johnny Depp was still compelling. That io9 retrospective is good. I too loved this movie as a teenager. It's kinda engineered to appeal very directly to adolescents, in the same way that Ender's Game is: hey, I too am AWKWARD and ISOLATED and SPECIAL and THIS MOVIE SPEAKS TO ME. I haven't seen it for years and at this point I'm a little afraid to. And yeah, Johnny Depp is really good in this. The moment when Dianne Weist discovers him in the castle, which he plays as if he were a scared baby bird; the moment when Winona Ryder tells him "RUN!" and his heart breaks because he knows his life as part of society is over. The Buzzfeed article lifts a lot from the annotations on the Dazed article, but I did not know this: "The crew took facades of the houses and reduced the size of the windows to make it slightly more paranoid-looking." And now I can picture it: yes. I think the comments in the articles are exactly right: if it were made today, the pastel suburb would be a few houses on a lot plus a whole bunch of CGI set extension. It gains a lot by being entirely practical: it has a strong feeling of being a real, disconnected-from-our-reality place.